"Entrance to Devil's Oven, Below Middle Falls"
Geo L. Washburn, Castile, N.Y.
For many years the bravest visitors to the Glen Iris Estate would venture down the many stairs once found along De ga ya soh Falls and find themselves on the floor of the Portage Gorge. From there they edged along the river to the Middle Falls, where they could find shelter in the natural cave called "Devil's Oven". 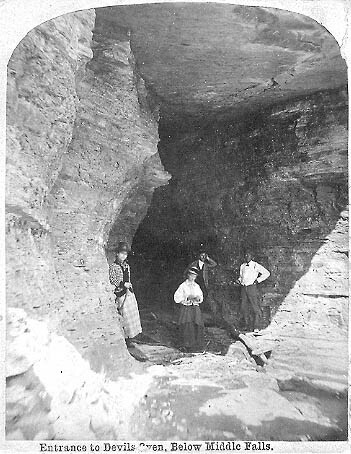 This view shows four visitors posing in the mouth of the shallow cave. Visitors are no longer allowed into the dangerous river bed or in the vicinity of the cave for safety reasons. 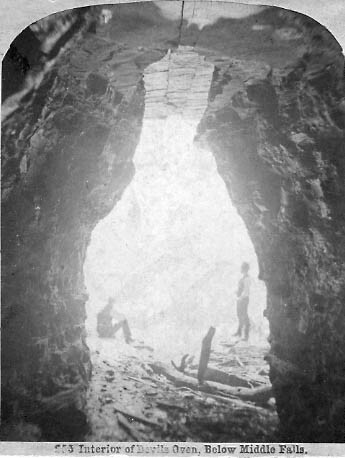 "253 Interior of Devils Oven, Below Middle Falls"
Geo L. Washburn, Castile, N.Y."
The photographer has moved inside the cave to make this image. The brightness of the sunlight has washed out much of the image, but one can still get a feeling of what it would be like to be inside Devils Oven. The dangerous river bed and Devil Oven is, of course, off limits to modern visitors. You can, however, get an idea of what it would be like to see the Middle Falls from the cave in our Image 88.